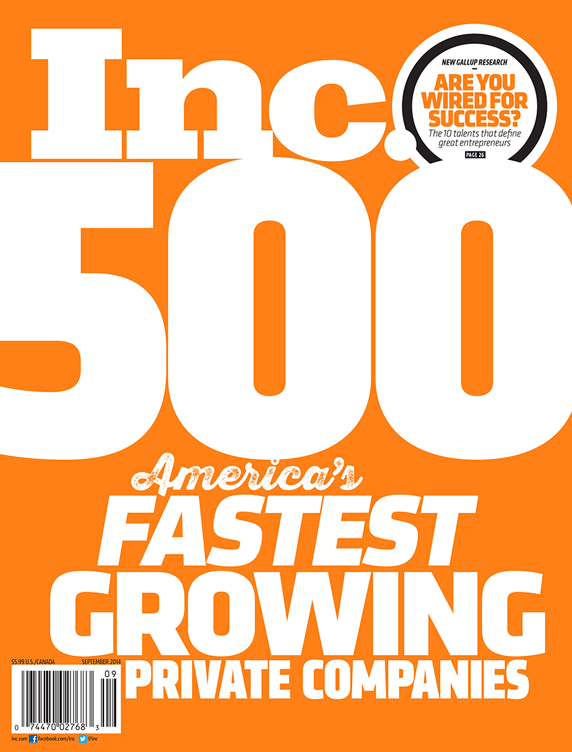 Inc. Magazine today named Smashwords to its 2014 list of America's Fastest-Growing Privately-Held Companies. 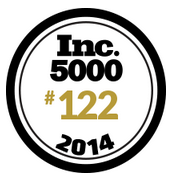 Smashwords landed at #122 in a field of 5,000 companies within the Inc. 5000, and was named the #1 fastest-growing media company and the #3 fastest-growing San Jose Metro area company. Inc. Magazine bases its ratings on three-year revenue growth. With audited revenue of $706,000 in 2010 and $22 million in 2013, Smashwords showed 3,019% growth. Credit for this achievement goes first and foremost to Smashwords authors and publishers. Nearly 100,000 indie authors and small independent presses today utilize Smashwords as their ebook publishing and distribution platform. We provide you to tools, and you publish amazing books that bring reading pleasure to millions of readers. It's because you entrusted your books to Smashwords that we've been able to share in a small piece of your success. The rise of Smashwords is the story of the rise of self publishing. Self published authors now have the freedom and capability to publish with complete pride and professionalism. The stigma that once haunted self-published authors is quickly melting away as Smashwords authors and publishers set the standard for ebook publishing best practices. You are the pioneers who will lead book publishing to a better, more democratic future. You are the future of publishing. I've been singing the same tune for six and half years. It's great to see authors embracing their new-found freedom, believing in themselves and serving readers with high-quality, low-cost ebooks. It's great to see how the rise of indie ebooks has fulfilled the dreams and changed the lives of so many Smashwords authors. This milestone also wouldn't have been possible without the hard work of my team at Smashwords. From vetting to service to finance and engineering and marketing, every Smashwords team member comes to work with the single-minded purpose to serve writers. We're here to provide you a competitive advantage in the marketplace. We exist for you. We realize that every Smashwords author works with us by choice. We're thankful you choose to do business with us. We strive to reciprocate by giving you full access to our ever-growing and ever-improving suite of tools that connect you with readers. We offer these tools without cost and without exclusivity. When you choose to fully distribute with Smashwords, you're directly supporting our ability to invest in the development of new tools, new distribution and new capabilities to help you reach more readers. As long as you work with us, we're here to work with you. The Smashwords business has been profitable for over three years, and we've managed to maintain this profitability while reinvesting in the business to give you competitive advantage. This is a low margin business, which means we must make difficult decisions every day to prioritize our resources. It means we cannot and should not try to be all things to all people. We're focused on the logistics of connecting ebooks with readers. When prioritizing resources, we ask, "what will give our authors the greatest aggregate benefit?" I'm often asked how we got here, wherever here is. I suppose here today is the milestone we're celebrating. Smashwords is an Inc. 500 company. As most Smashwords authors know, I was inspired to start Smashwords after my wife and I wrote a novel together. Despite representation from a top tier literary agency, publishers were unwilling to take a chance on it. The experience led me to realize that publishers held too much power, because they alone decided which writers graduated to become published authors. They decided which manuscripts became books, and they decided what readers could read. My vision for Smashwords was to turn everything upside down and give all the power to writers and readers. Give writers the freedom to publish what they want, and give readers the freedom to read what they want. Although only in my wildest dreams did I dream Smashwords would reach such a milestone, I never expected it. In fact, I knew the odds were stacked against us. I thought the business would most likely fail. In the darkest days early on - those days when on a good day we were earning only $1.00 a day in commission - the thing that kept me going was my belief that the world needed a Smashwords. I had faith that if I could give all writers a chance, and few of them would break out and change everything for all writers. We've traveled a lot of ground in six and half years. We've overcome numerous roadblocks, experienced our fair share of growing pains, made our fair share of mistakes and took a lot of bullets. We've also received a lot of love, and that sustains us more than anything. We've had the good fortune to work with amazing authors and amazing retailer business partners. The business has been entirely self-funded without the assistance or interference of venture capitalists or outside investors. This has given us the freedom to build a business around some very simple if not unconventional principles which guide how we manage the business. I'll share them now for the first time. Every writer is special, and holds the potential to contribute something worthwhile to the culture of books. Every writer should have the freedom to publish at no cost. The worth of a writer's book cannot be measured by sales alone. The money should flow from reader to author. We only earn commission if we help authors sell books. We believe this aligns every fiber of our business - every motivation, every decision and every action - with the best interests of our authors and publishers. We serve our authors and publishers by working to enable a diverse and vibrant global ecosystem of multiple ebook retailing channels. We believe it's in every author's best long term interest that we promote broad and diversified distribution. We believe in the value of a great distributor. We believe distributors will become more important in the future, not less so. A good distributor provides efficient digital logistics for the benefit of authors, publishers, retailers and readers alike. We constantly strive to become a better distributor. We believe that authors who leverage the full benefits of a distributor will be more successful over the long term than those who do not. Distributors help authors spend more time writing and less time on distribution. It's about time management. Time is every writer's most precious asset. We believe past success is no guarantee of future success. Success must be earned. The moment we stop innovating and adding value to the publishing and distribution experience of our authors and readers, we lose our right to exist. Innovation is messy. We promise we will blaze new trails and take prudent risks. We will always strive to work in the best interest of our writers. We will make mistakes and we will learn from our mistakes. We will help and encourage our retailer partners to improve their businesses for the benefit of our authors, publishers and their readers. We also appreciate when our retail partners do the same of us. Our development will be guided by our authors, publishers and retailers. If we add more value than we earn in commissions, we have a future that is without limit, because the talent, creativity and capability of our authors is without limit. Our authors and publishers are not our customers. They are our partners, our clients. We do not sell them anything, we service them. We will not accept money from them. We will not employ salespeople and we will not sell publishing packages. We believe the future of publishing is bright because books are important to the future of mankind. As long as writers have a chance to publish, readers will want to read. We are in a relationship with you, the author, publisher, reader and retailer. We will be honest in all our dealings with you. The ebook business is entirely dependent upon trust. When trust is deserved and reciprocated, great things can happen. We will never forget that we serve at the pleasure of our authors, publishers and retailers. Smashwords and the indie community we serve are in the same boat. We've built a great business, but I don't expect the torrid growth to continue. As I predicted in my 2014 projections, the ebook market has slowed and sales are likely to be lower this year than last. Prior to starting Smashwords in 2008, I spent almost 20 years doing PR and strategic communications consulting for venture-backed Silicon Valley tech companies. Working in tech, you come to expect cyclical swings of boom and bust followed by boom again. The survivors of the shakeouts emerge stronger and more vibrant than ever. A shakeout is coming, not just for the ebook industry but for authors as well. Things will get tougher from here. Ebooks never go out of print. There's a glut of high-quality reading material out there. The growth of in the number of ebooks published and forever immortal on digital shelves will probably outpace the growth in reader eyeballs, and therefore the capacity of readers to consume this content. In other words, every one of us will face more competition in the future. The average book in the future will sell fewer copies, not more. The easy days are behind all of us. Yet more books will be read than ever before. The opportunity is there for all of us. I thrive on challenge. The new business realities don't change how we run the business. It's an environment where author production (the number of titles published each year) and author quality will be the key determinants of success. If you're an author, it's about time management. How will you increase your production, quality, discoverability and desirability? How will you increase your capacity to serve your readers? For Smashwords, it's about innovation. We will continue focusing on innovation. We'll build new tools and capabilities that give our authors an advantage in the marketplace. It's not only a business strategy, it's a Darwinian necessity. Every one of us, whether we're a retailer, a distributor, a publisher or an author, must add value to the reader's experience otherwise we fail to live our dream. The spoils will go to those who innovate, adopt and pioneer best practices, and who persevere through the darkest days. If you're an author - even a New York Times bestselling author - you've had those dark days where you wondered if you had the will to carry on. Think back to our early days at Smashwords when were were taking in only $1.00 a day yet losing thousands of dollars a month. We kept going because we had this crazy idea that the world needed a Smashwords. Well, your readers need you. Serve them. Your best work is ahead of you if you persevere. I hope you invite Smashwords to join you for the ride! Congratulations to you and your team - well deserved and I know that you will be moving from strength to strength ! My first mystery novel was book 411 for Smashwords. I wondered how you could possibly be making any money back then. Turns out you weren't! But you were in it for the long haul and it's paid off for you AND for us. Thanks for the great work you and your team are doing, and best wishes for Smashwords and all of its authors! Love the news and congrats to Mark and team SW! Also feeling better about my $1 sales days. Congratulations Mark, this is wonderful and well deserved!!! I think the best decision I ever made was to publish with Smashwords. keep up the good work, Mark. we're counting on you. Smashwords needs writers; writers need readers; readers need writers; writers need Smashwords. Well done! I put my first stuff on Smashwords in 2009 when you, Mr Coker, were replying to support e-mailsA personally... probably from your kitchen table. So I'm delighted it's working out. I hope Smashwords goes from strength to strength. I'm a huge fan of Smashwords, Mark, and your success is because you recognized a need and are filling it well. There's demand for what you do. Keep on your toes by recognizing shifts in the market and adjust accordingly. I had a computer hardware wholesale business that went to 3 million a year after a few then leveled then went down to nada because I never changed the biz model. No problem, I became an Indie! Good on you, as they say in the South. Congratulations, Mark and everyone at Smashwords! My books have been on Smashwords since 2009, and it's been wonderful to see how things have bloomed since then. Smashwords made it possible for me to transition from unpublished writer to indie author. Many thanks to you and your team, Mark, and congratulations on your success. Thanks Mark and team for making it possible for me to publish my books. I always knew I was a writer, but it was Smashwords that ultimately made it possible for me to share my writing with the world. May Smashwords continue to flourish. Congrats Mark. When would I get a chance to see myself too in such top lists? Seriously..
As authors, we love praises. It's akin to how a flower loves sunlight. Ever so gently, we'll lean towards such stuff. As Smashwords continues to growm, don't forget that many of us authors have grown with you. Not just in popularity or revenues, but in knowledge as well. Those really cool metrics wouldn't look so good without the large base of writers to fuel the grand experiment for redefining the publishing world. This shared learning experience will carry with us for life. Before, I didn't know how to use 3D art or photoshop, I didn't know how to market, or even how to make a nice book trailer. That education was possible because I'm involved with Smashwords. So thank you for that. One day, the Trad Publishers will realize their secrets have become common knowledge. I've heard some call Indie Publishing the 'New Slushpile' of undiscovered novels. I disagree. That terminology probably came from a jealous editor somewhere. With millions of new ebooks flooding all digital shelves, getting discovered may be harder, but the rewards are much deeper when it does happen. I may never, ever hit a best seller list anywhere. That's fine. My novels are out there forever now. Besides, while we all dream of being on such a list, I do know a best seller isn't always about the contents. Best selling doesn't always equate to best written novels. Before I die of old age, I intend to produce some of the best written novels to Earth's population. If I'm in the grave when it's discovered and starts to entertain billions of people all over the world, that is the mark I intend to make. That is the moment that can make our memories nearly immortal. After joining you in 2010 I have to say the improvements you have made over the years make it a breeze to utilize your service. Great job on streamlining the process and creating new markets to distribute our books. Authors greatly benefit from participating in all arenas and Smashwords makes it possible and painless. Congratulations, Mark! This is an amazing achievement. May this company continue to grow from strength to strength! Congratulations, Mark! I have the magazine and see where Smashwords is listed. How exciting! As always, Mark and Team, Thank you for ALL you do! Congrats on you hard earned and greatly deserved success. soon to be uploaded "Feast of Jackals"
Well deserved award, Mark. You've been an inspiration for all of us and continue to push us to higher levels of professionalism and production. I praise Smashwords with every writer and reader I meet. I'll be doing my first pre-sell in a few weeks and explain this to writers and readers as well. When I started to upload to Smashwords (after having studied your great guide), I used to be somewhere around #9 in the conversion line--last time, it was #117! And still, everything went smoothly, despite the enormous growth of SW.
Congratulations, Mark. And thank you for the great platform you provide for us Indies to "strut our stuff" before the world (without agents and the hallowed halls of big publishers). You deserve every bit of the small cut that goes to you.